TIMELESS TALES OF THE WORLD’S GREATEST HEROES—FROM THE LEGENDARY CREATOR OF THE SANDMAN AND AMERICAN GODS. What evil is so powerful that it can melt the Man of Steel—and extinguish the Green Lantern’s light? How did Poison Ivy’s power first take root—and where did the Riddler find his calling? The answers to all these questions and more are revealed in THE DC UNIVERSE BY NEIL GAIMAN: THE DELUXE EDITION, collecting for the first time in a single volume eight of the award-winning author’s celebrated stories of super-heroics! 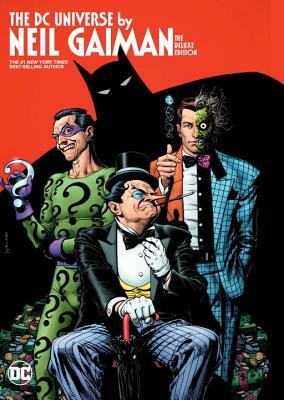 Illustrated by a host of comics’ top talents—including Andy Kubert, Mark Buckingham, Simon Bisley, Michael Allred, John Totleben, Matt Wagner, Kevin Nowlan and Jim Aparo—THE DC UNIVERSE BY NEIL GAIMAN features all-star adventures from the pages of SECRET ORIGINS, BATMAN BLACK AND WHITE, SOLO and WEDNESDAY COMICS, as well as the never-before-reprinted graphic novel GREEN LANTERN/SUPERMAN: LEGEND OF THE GREEN FLAME and the complete saga of BATMAN: WHATEVER HAPPENED TO THE CAPED CRUSADER?, with afterwords from the author and a special sketchbook section from Andy Kubert. Neil Gaiman is the New York Times best-selling author of the Newbery Medal-winning The Graveyard Book and Coraline, the basis for the hit movie. His other books include Anansi Boys, Neverwhere,American Gods and Stardust (winner of the American Library Association's Alex Award as one of 2000's top novels for young adults) and the short story collections M Is for Magic and Smoke and Mirrors. He is also the author of The Wolves in the Walls and The Day I Traded My Dad for Two Goldfish, both written for children, as well as the creator of the most critically acclaimed comic series of all-time, The Sandman. Among his many awards are the Eisner, the Hugo, the Nebula, the World Fantasy and the Bram Stoker. Originally from England, he now lives in the United States.